A simple classic cremation urn designed and crafted from hardwood here in the United States. Available in stained Cherry, natural Oak, natural Walnut, or Rosewood stain on Cherry. Loaded through bottom opening panel. As with all urns, it is important to keep the cremains in a sealed plastic bag inside the urn. 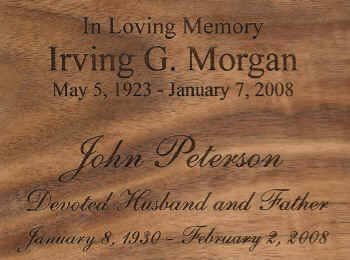 Engraving is available on the front of the urn or the top of the urn. Please limit engraving to no more than 35 spaces per line. Check engraving information to be sure spelling, punctuation, capitalization, and dates are correct. Engraving will be done exactly as submitted.